Insulin resistance is a health condition that occurs when your body makes insulin but doesn't effectively use it to absorb glucose from your bloodstream, which results in high blood sugar levels. If left untreated, insulin resistance can lead to prediabetes and type 2 diabetes. Making lifestyle changes and adopting healthy eating patterns can reverse insulin resistance and prevent diabetes. While there aren't diets specifically designed for insulin resistance, the National Diabetes Information Clearinghouse (NDIC) reports that healthy eating, losing weight, and boosting physical activity help reverse insulin resistance. NDIC suggests referring to the Dietary Guidelines for Americans 2010 for healthy eating advice when you have insulin resistance. Meal plans containing 1,200 to 1,500 calories daily help most women safely lose weight, and weight-loss plans providing 1,500 to 1,800 calories are often effective for men and active women, notes the National Heart, Lung and Blood Institute. If you need help downloading the printable version of the meal plans and food list, check out these helpful tips. Download the meal plans and food list. The National Diabetes Information Clearinghouse reports that the Dietary Approaches to Stop Hypertension (DASH) diet can decrease insulin resistance when combined with regular exercise and weight loss. DASH diets are low in sodium, trans fats, saturated fats, sweets, sugary drinks and red meats. 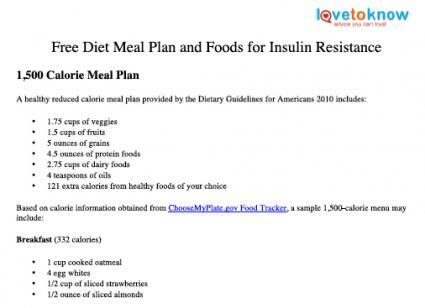 It's helpful to become familiar with ChooseMyPlate.gov portion sizes for healthy foods to create your own insulin resistance menus using the Dietary Guidelines for Americans 2010 meal plans. Keep in mind certain foods can fall under more than one food group category, and you're not limited to just the foods in these lists. 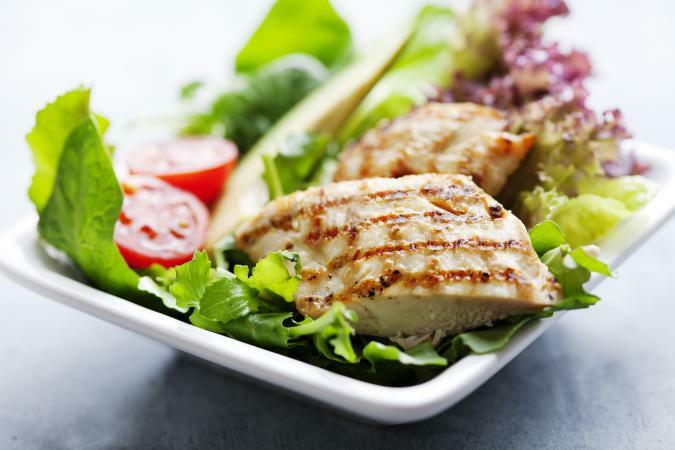 Choosing a variety of foods from these healthy food-group lists, controlling your overall caloric intake, losing weight if you're overweight and exercising regularly can reverse insulin resistance and prevent your risk for developing type 2 diabetes.